"A very enjoyable stay as always. Very comfortable bed and nice room. Dinner very good as always. "Great location and great hotel. Will definitely be back." The hotel itself has two fantastic bars, The Gallops is the main bar, traditional in style, classic and designed with comfort in mind. The Saddle Bar is also traditional in style, classic and cosy with its very own snug, it also offers a fantastic carvery lunch on Sundays. Relax and Unwind in Kildare Town’s newest hotel, the Kildare House Hotel with 21 comfortable guest bedrooms offering a wide range of accommodation types to suit all requirements from Single, Double, Twin to our Larger Superior Room. Fall asleep effortlessly. Kildare town has the advantage of having 2 really beautiful churches - The Carmelite White Abbey Church and St Brighids Cathedral. The National Stud and Japanese gardens are only 5 mins away where the wedding party can take their wedding photos, this is included in the wedding package. Enjoy a discounted VIP Shopping Experience at Kildare Village Chic Outlet, including: -Overnight stay in one of our double/twin en-suite rooms. -VIP card to the outlet which gives you 10% off your shopping. -10 % discount for Newbridge Silverware -3 course evening dinner in our Gallops Restaurant -Lazy Breakfast served till 11:45am Advance Purchase Terms - booking is strictly non refundable, and non transferable or amendable. Family Operated 21 bedroom hotel in the heart of Kildare town and only thirty minutes from Dublin, the Kildare House Hotel has the welcoming ambiance of a Country House Hotel with the advantage of being perfectly located in the heart of Kildare town. ... and thank you so much for considering The Kildare House Hotel for your special day. 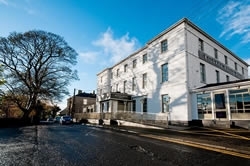 The Kildare House Hotel is a newly renovated 21 bedroom hotel in the heart of Kildare town. The hotel has the welcoming ambiance of a country house however only thirty minutes from Dublin. The elegant ballroom can seat up to 160 guests and is a wonderful wedding venue. All the bedrooms have been recently renovated, they are all en-suite with satellite TV and free Wi-Fi. We highly recommend a viewing and we would be delighted to meet with you and discuss any requirements for your special day. Kildare House Hotels ideal location provides a perfect base for our guests to visit the local attractions and activities in Kildare. For those who enjoy seeing the best racehorses and horsemen in the world doing what they do best on a glorious stage then a visit to the Curragh Racecourse is a must. This racecourse, steeped in tradition, is where the Five Classic races are held including The Dubai Duty Free Irish Derby. Kildare is known as Ryder Cup County! Some of Irelands best golf courses are dotted around the county of Kildare. There is so much choice there is something for the amateur to the pro. The infamous Irish Tayto crisp has opened it's very own theme park. The park is filled with a large playground, zoo, zip wire, rock-climbing walls and much more. It is the perfect day out for all the family. 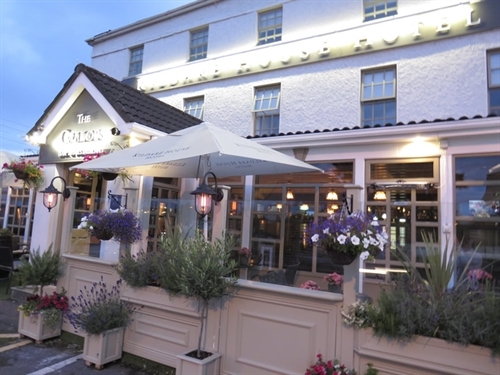 Kildare House Hotel is located just a 5 minute walk from Kildare Village Outlet Shopping. The Village is located at exit 13 off the M7 less than an hour's drive from Dublin Airport and Dublin city centre on the motorway linking Dublin and Limerick. Kildare town is only five minutes off the main M7 motorway and only 30 minutes from Dublin. Kildare town is serviced extremely well by Irish Rail and Bus Eireann and there is a direct bus from Dublin Airport which takes about 40 minutes. When it comes to restaurants in Kildare town look no further than the Kildare House Hotel, the hotel itself has two fantastic bars. The Gallops is the main bar, traditional in style, classic and designed with comfort in mind. The Gallops serves fine food 7 days a week, breakfast from 7.30am, lunch from 12.30 and dinner from 6.00pm. The Saddle Bar is also traditional in style, classic and cosy with its very own snug, it also offers a fantastic carvery lunch on Sundays. The Saddle Bar can also be hired privately for events for up to 100 people. At The Kildare House Hotel we can cater for Events up to 200 guests and we can also facilitate your more intimate gatherings. When it comes to restaurants in Kildare look no further than the Kildare House Hotel where our Head Chef, Alun has a selection of menus available from Finger Food to Lunch & Dinner. Kildare Town Tourist Office & Heritage Centre is an exciting visitor attraction in the centre of this historic town, with a multi-media presentation telling the story of the town from when St. Brigid established her church in 480 AD. The Heritage Centre is also a great place to visit to find out more to do around Kildare Town and County during your visit. The Round Tower on the grounds of St. Brigid’s Cathedral is the highest accessible round tower in Ireland. The new St. Brigid’s visitor centre, Solas Bhride is less than a five minute drive from the hotel.